In our seventh installment of Who Knew? Helpful Kitchen Tips, here are ten simple fixes for common kitchen dilemmas. I’ve also included a few fabulous tips that readers shared on my last Who Knew? post. Do you have a useful kitchen tip? Please share in the comments below! 1. The flavor of vanilla extract fades with prolonged exposure to heat. 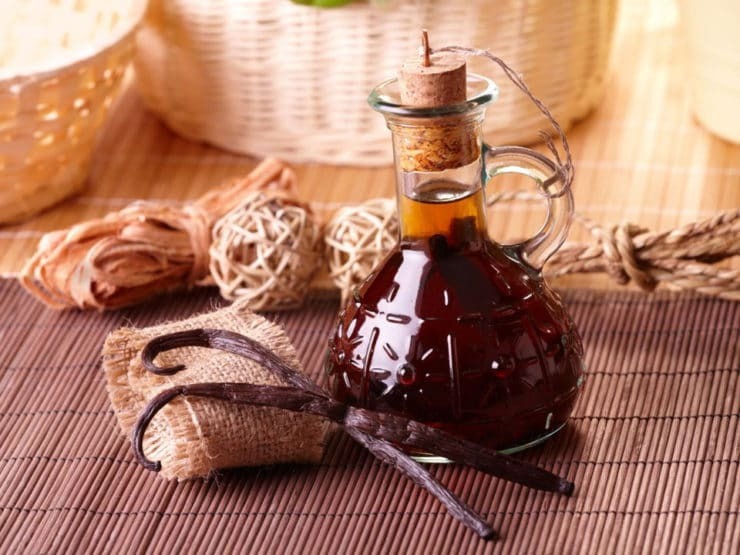 Extend the life of your vanilla by storing it in a cool, dark place like a pantry or spice drawer. 2. The next time you plan to cook meat or poultry for dinner, try rubbing it with salt (also known as a “dry brine”) and storing it in the refrigerator the night before. The meat will absorb the salt, which results in more moisture and better flavor. Just remember to rinse off any excess salt before cooking. If you are using kosher meat, it is usually salted already– proceed with care to avoid over-salting! 3. Filling a pepper mill can be messy business. A quick and easy way to keep peppercorns in place is by using a disposable envelope as a funnel. Simply fill the envelope with peppercorns and snip off one of the corners. The peppercorns will flow straight into the mill rather than all over your floor! 4. Try using a tea strainer or wire mesh strainer when decorating with powdered sugar to create an even, pretty shower of sugar. 5. Place a slightly dampened dishtowel under your cutting board to keep it from sliding around on smooth countertops. 6. Cook meat faster by following these simple guidelines. Remove from the refrigerator 1 hour before roasting, 30 minutes before grilling and 10 minutes before sauteing. Room temperature meat will cook faster and more evenly than meat that just came out of the refrigerator. 7. So what does softened butter really mean? Softened butter should be soft, but not too soft and definitely not melted. Around 67 degrees F is the ideal temperature for use in baked recipes. When pressed, it should give slightly while still holding its shape. 8. Have leftover tomato-based sauce from your meal? Let it cool to room temperature, then freeze it in ice cube trays. The frozen cubes can easily be reheated when you need a quick sauce for a weeknight meal. This works best with dairy-free sauces like marinara and arrabbiatta. 9. Every latke maker knows that shredded potatoes turn brown fast. Dissolve a vitamin C tablet in 2 tablespoons of water and add it to your shredded potatoes. This will help to ensure that your last batch of potatoes is as white as the first. 10. If you’re steaming or boiling strong-flavored vegetables like asparagus, broccoli or artichokes, save the cooking water as a broth for cooking rice or pasta. It will lend a nice, unique flavor to your dish without any extra effort. Put DEFROSTED spinach into a potato ricer. Press handles together and “presto” no more water! Do you have a favorite kitchen tip to share? Leave it in the comments below. Your tip might be featured in my next installment of Who Knew! I usually purchase 25 lb bag of flour. I put the flour in a bunch of Freezer Bags and then freeze them. The flour stays fresh and it does not freeze solid. Just take a bag or two out the night before so it gets to room temperature. Been doing this for years. I prepare cake pans with butter and then dust with dried commercial plain bread crumbs instead of flour. There is never any discoloring residue even on chocolate cake and the cakes release wonderfully. The bread crumbs completely disappear into the cake. Years ago when taking a cake decorating class, my teacher shared what she called her “Magic Mix”. Instead of the old way of preparing your cake pans with a coating of shortning, then dusting with flower, this stuff is one simple step and it leaves no dry, flaky residue on your cake. It is FABULOUS! Combine equal parts of shortning, vegetable oil and flour. I generally make it using one cup of each. I store it in a plastic container in my cupboard. I cut a hole in the middle of the lid and leave my pastry brush in the Magic Mix all the time. It is one of my BEST tips for the kitchen. This will last for months without going rancid. I promise, you will love the result. My grand kids love to help me in the kitchen and they especially love “painting the pans” when we make cakes and muffins. To make Greek yogurt I put the yogurt into a paper coffee filter which is sitting in a funnel which is sitting over a glass or cup. Empty the glass frequently as the liquid continues to fall out. I put it in the fridge overnight and the next day it is ready to eat. If you use hamburger frequently, buy in 3-5 pound package. Cook all at once, drain off fat and freeze in freezer bags. 2 2/3 cup cooked hamburger =1 pound. Do you have a good recipe for lemon Passover cookies? I love your recipes- always interesting and the photos make them so easy to follow. A finely serrated knife is the perfect tool for removing the charred peel off roasted peppers. A hardware-store soldering torch allows re-touching the indentations of the peppers the range’s gas flame does not get to. It is also a better tool than the broiler to brown or caramelize the tops of anything under control; from flans to baked squashes, to cheesy casseroles. Peel ginger with the side of a spoon. Peel whole garlic cloves by banging them hard inside a lidded jar. Ginger and garlic cloves stay fresh very long if immersed in white wine. The resulting flavored wines are excellent for cooking. Sweetened, the ginger flavored wine is very refreshing. Pie cooling racks work well to char or roast several peppers atop a gas flame. My husband discovered slicing aged cheddar with a veggie peeler keeps it from crumbling like it does if we use our Swedish slicer. I learned this recently and IT WORKS ! If you have a problem with tiny critters getting into your flours, try this. Store your bags of flour in zip lock bags and put 3-5 bay leaves in the bottom of the bag. The little critters HATE the smell of bay and won’t go near your flour. A few weeks ago I opened a sealed tin of Hungarian Hot Paprika, only to find it full of tiny hard-shell beetles of the type one can find in old flour, grains, etc. The eggs have to be in the food to begin with—and if you store it past as point, they hatch. But if the bay leaves prevent the eggs from hatching; that’s reallygood to know. I store onions in the fridge to keep the tears away. Works great! When I am pressed for time, I buy a roasted chicken if a recipe calls for cooked chicken. I take the meat off then put the bones in a freezer bag to freeze. Then use the bones later to make chicken stock. Use a cake nail to bake cakes evenly. No more rounded tops! Keep red spices like paprika, chili powder, red pepper and others in the fridge. It helps to retain color and keeps insects out. Put rice at bottom on salt container to keep moisture away. The little packets reading “DO NOT EAT” that come with pills work very well also. Needless to say….